This is as good of a job as I could have done to describe the stories contained in this collection of Spencer’s short fiction. Overall these were delightful stories (full of delight) where William Browning Spencer tells the stories as straight as he can with the one bit of weirdness the story contains. Spencer reads like a combination of Kelly Link and Alan DeNiro (this is a good thing). Worth checking this slim volume out if you get the chance. March, by Geraldine Brooks: Have you read Little Women? If so, did you ever wonder what happened to the Father while he was at war and left his girls behind? Neither did I, but apparently Geraldine Brooks did and decided to write a book about it. Enough readers must have wondered the same because March also won the Pulitzer Prize a couple years back. Alternating between Mr March during the War Years and Mr March as a young man making his way in the world March is his story and works as a companion volume to Little Women. March is also a fairly well told story and written in what feels like the style of Little Women but the prose flows for a modern reader. I highly doubt that March was the best novel of its year, but it is a well written piece of fiction and reasonably short...but lord, I really didn’t care what happened to Mr. March. It was a fun literary experiment for the author, but I imagine that if Louisa May Alcott wanted to tell the story of Mr. March she would have written the novel herself. Call this fan fiction and you’re not far off the mark, though clearly more accomplished, published, and honored than any piece of fan fiction will ever be. Maybe I can write the story of what happened after the end of The Road and get published....more likely Little Women is now in the public domain so it is fair game to use these characters. Wild Cards: Aces High, by George R. R. Martin (editor): This second entry in the Wild Cards series of shared world mosaic novels feels much more like a coherent novel than its predecessor. The first Wild Cards novel introduced us to a world where an alien virus ripped through part of the world’s population. Most of the infected died, most of the survivors were transformed into misshapen monsters called Jokers. The lucky few, perhaps 1% of all infected, developed super human powers and became known as Aces (those who died “drew the Black Queen”). Now set during the early to mid 1980’s Aces High tells the story of an impending alien invasion by something called “The Swarm”. Through a collection of related short stories written by a variety of authors and linking stories by George R. R. Martin, an actual novel takes shape with various viewpoint chapters. Each story is self contained yet builds to something bigger and the story arcs all build the framework of the novel. 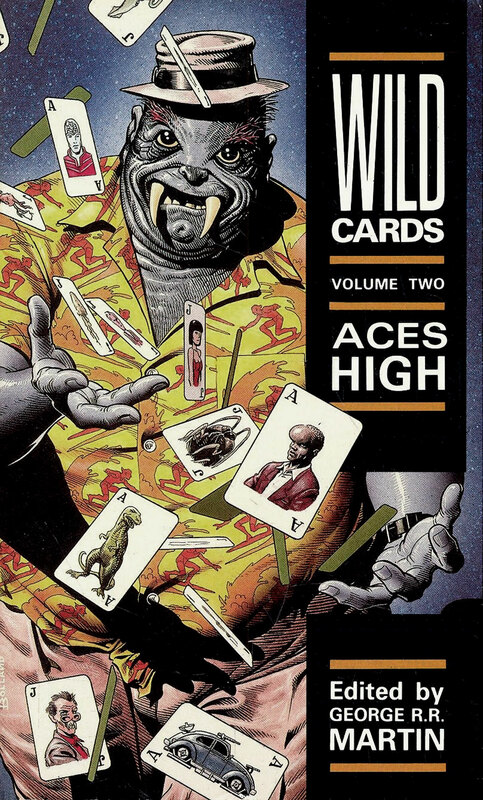 Aces High is a very strong entry in the Wild Cards pantheon and I am very interested in seeing what comes next. This was only the second volume (published in 1987) and Martin has edited Volume 18 (Inside Straight) to come out next year. The William Browning Spencer collection was a real mixed bag for me. I thought the title story, "The Oddskeeper's Daughter," and "Foster Child" were all excellent, but there were two or three other stories that just didn't do it for me. If I remember correctly, there were two virtual reality stories - one too many for me. Yeah, you know I get what you're saying about the Spencer, but at the same time I felt that the stories which worked (Oddskeeper's Daughter first among them) was enough to make me feel positively about the collection...but you're right. It is a mixed bag, but a mixed bag I remember fondly, like there were no walnuts in the bag of nuts.